While the RBI confirmed its former governor had sent in a list of high profile NPA fraud cases, the PMO refused to provide any information or details. New Delhi: Information disclosed in response to an RTI request made by The Wire has confirmed that former Reserve Bank of India governor Raghuram Rajan indeed notified Narendra Modi of the need to probe key defaulters as early as eight months into his prime ministerial tenure – advice that the government failed to act upon. At the time Rajan’s letter was made public, a section of the media had tried to suggest that the ‘PMO’ the former top banker was referring to was Manmohan Singh’s rather than Modi’s, since his term spanned both the UPA and NDA’s time in office. 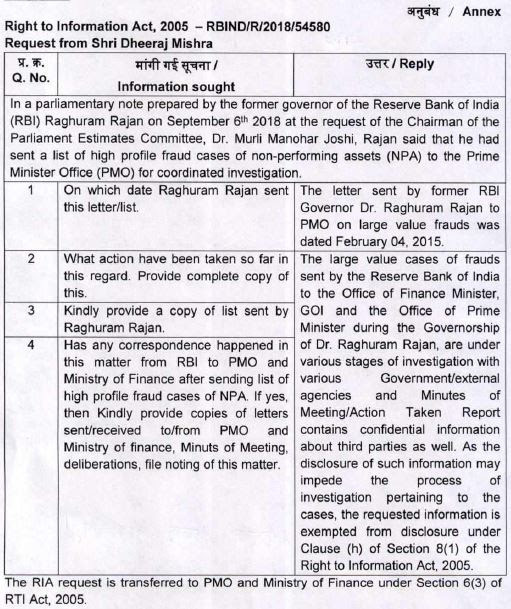 Putting all speculation to rest, the RBI has said in response to The Wire‘s RTI query that Rajan’s letter to the PMO about the defaulters suspected of fraud was written on February 4, 2015. According to the RBI, Rajan sent this list not only to the PMO but to the officer of the finance minister, Arun Jaitley. On September 6, 2018, Rajan submitted a 17-page note on India’s NPA problem to parliament’s estimates committee at the request of its chair, Murli Manohar Joshi. Though he mentioned asking the PMO to act against a list of major defaulters, his note did not make clear who the prime minister was at the time. Therefore, the estimates committee had said that to overcome any kind of confusion, it would ask Rajan to specify the date on which he had written to the Prime Minister’s Office. Support journalists who are unafraid to ask the right questions. Just Rs 7 per day from readers like you will keep The Wire going. More details here. The RBI said, “The large value cases of frauds sent by the Reserve Bank of India to the office of Finance Minister, GOI, and the Office of Prime Minister during the governorship of Dr Raghuram Rajan are under various stages of investigation with various government/external agencies and minutes of meetings/action taken report contains confidential information about third parties as well. As the disclosure of such information may impede the process of investigation pertaining to the cases, the requested information is exempted from disclosure under Clause (h) of Section 8(1) of the RTI Act, 2005”. Reserve Bank of India’s reply to The Wire’s RTI query. Rajan had also conveyed to the PMO how ‘unscrupulous promoters’ had inflated the cost of capital equipment using over-invoicing of imports. While the RBI has been somewhat forthcoming, both the Prime Minister’s Office and the Ministry of Finance have deliberately hidden information about Rajan’s list. Indeed, the PMO gave a very surprising answer: It wrote that Rajan’s letter does not actually come under the purview of the right to information. Parveen Kumar, PMO under secretary and public information officer, wrote in reply to the RTI request, “The matter sort is in the form of a roving inquiry and does not come under the definition of “information” under Section 2(f) of the Right to Information Act.” The PMO refused to even make public the date Rajan’s letter was received by it, let alone any action related to it. 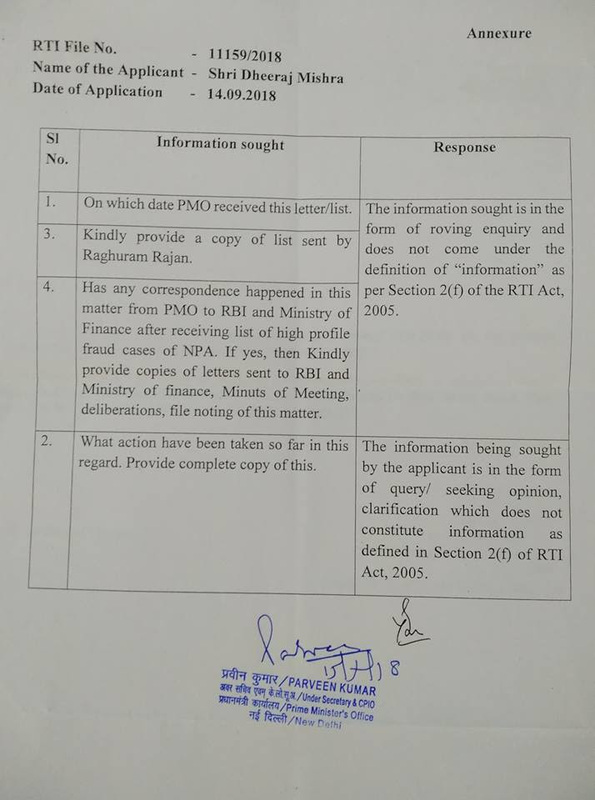 PMO reply to The Wire’s RTI request. Asked what action was taken after receiving Rajan’s list of NPA defaulters suspected of fraud, the PMO replied that this information does not fall within the scope of the right to information. “The information being sought by the applicant is in the form of query/seeking opinion, clarification, which does not constitute information as defined by Section 2(f) of the RTI Act,” the PMO wrote. On its part, the finance ministry too has made every effort to not give information. The ministry sat on the RTI application filed by The Wire for the first 40 days and after that, on October 24, sent the queries posed to four other branches of the ministry – the Revenue Department, Department of Economic Affairs, Department of Expenditure and Investment and Public Asset Management Department. A.K. 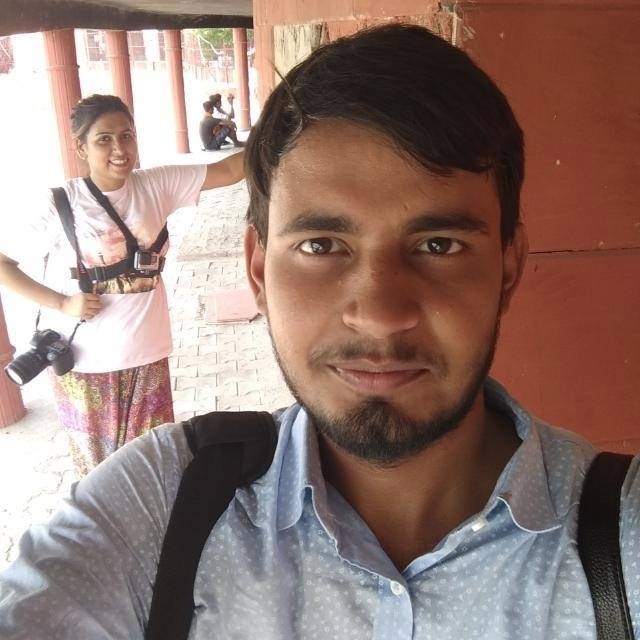 Ghosh, under secretary in the ministry’s Financial Affairs Department, said, “We have no information related to this.” After saying so, he transferred the RTI application to four other departments. However, according to the Section 6(3) of the RTI Acvt, if the information sought is not related to the PIO who receives the application, then he has to immediately send the application to the concerned PIO. The Department of Economic Affairs also gave the same information – that it does not have any information related to Rajan’s list. In such a situation, the question arises: If the RBI says that Raghuram Rajan had sent a list of big defaulters to both the prime minister and the finance minister, why are their offices unable or unwilling to provide any information related to this?